Will Drinking Green Tea Lower Androgen in Women? Are There Natural Alternatives to Androgel? Testosterone belongs to a group of hormones called androgens. While testosterone is generally recognized as an important male hormone, women produce a small amount of it as well, according to the National Institutes of Health or NIH. Unusually high testosterone levels may be a sign of various health problems including inherited disorders of the adrenal gland and polycystic ovary syndrome. Symptoms of PCOS may include unwanted facial hair and a deepening of the voice. 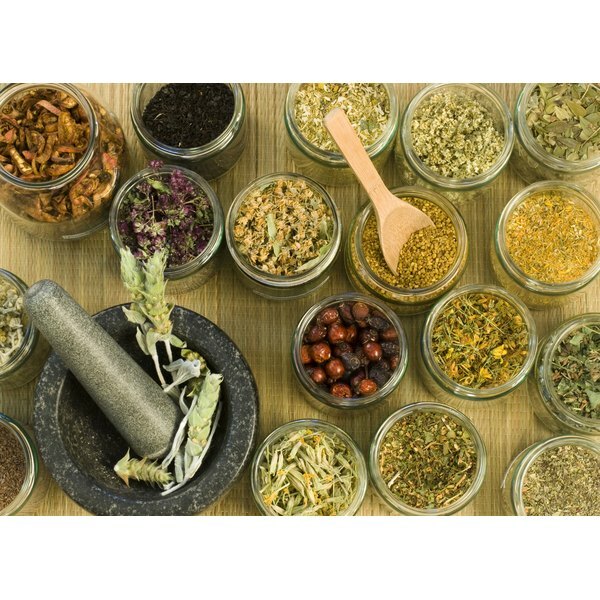 Certain herbs may have anti-androgen effects. Always check with your doctor about using herbs. Black cohosh is most commonly used to ease menopausal symptoms such as hot flashes as well as painful menstruation. Black cohosh also is regarded as an alternative therapy to manage cholesterol and relieve coughs. Black cohosh may help decrease testosterone levels due to its anti-androgenic effects, according to the University of Maryland Medical Center. Chaste Tree or Chasteberry, sold by the brand name Vitex, has anti-androgenic effects and may also fuel estrogen receptors. Chasteberry is suggested as an herbal remedy for painful menstruation, tender breasts and menopausal symptoms, according to Memorial Sloan-Kettering Cancer Center. Dong quai has been used medicinally for thousands of years. It has been dubbed "female ginseng" since it is often used to treat female-related problems including symptoms related to menstruation and menopause, according to the National Institutes of Health. Dong quai has been used to treat POCS that may be caused by excessively high testosterone levels in women. Saw palmetto has anti-androgenic effects and may help treated unwanted hair in females, according to UMMC. Saw palmetto is also used an a herbal remedy for prostate health and may help treat benign prostatic hyperplasia and stimulate urination. Spearmint may have the ability to lower testosterone under certain circumstances. A study published in May 2007 in the journal "Phytotherapy Research" found women with hirsutism who drank spearmint tea had lower amounts of free testosterone in their blood. Researchers concluded spearmint tea can be an alternative solution to anti-androgenic treatment for mild hirsutism.